Kilmarnock manager Gary Locke believes he now has the correct players on board to propel the Rugby Park side up the league this season. The Ayrshire club finished a disappointing 10th in the Premiership in 2014-15. Striker Kris Boyd, winger Kallum Higginbotham and goalkeeper Jamie MacDonald are three key acquisitIons. 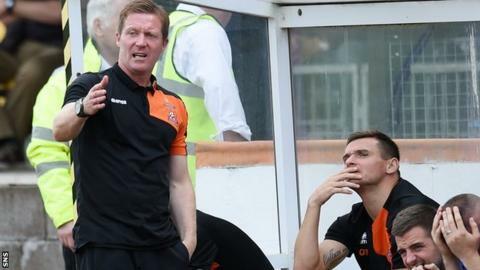 "With the season we had last year I just felt we had to get better players in," Locke told BBC Radio Scotland. "I've tried to sign players that I know what they're capable of and able to do week in, week out. "I feel I've done that but the proof will be in the pudding in the next two-to-three months because it's up to them to go and perform." Kilmarnock host Dundee in their Premiership season opener. Other additions to the Killie squad include midfielder Scott Robinson, defender Stevie Smith and forward Dale Carrick, who replaced some home favourites like Manuel Pascali and playmaker Alexei Eremenko. Irishman Mark Connolly takes over as captain from Pascali for the 2015-16 campaign, while ex-Rangers skipper Lee McCulloch has signed as a player-coach. Locke added that as well as improving their league position, he also wants to follow Scottish Cup winners Inverness Caledonian Thistle's example of putting another promising run together in one of the domestic trophies. "You look at Inverness last year and what they've achieved, and we're a very similar club," added the former Hearts boss. "It would be great if we could get a good cup run but I just want to make sure we do better than we did last year."